Awa-odori is a famous traditional Bon Festibal dance. Everyone can dance soon by the guidance of special dancers from Koenji Awaodori association together with wonderful sounds of drum, flute,bell, shamisen, etc. ! Dress: No restriction but easy to move like pants and T-shirt, sneaker. Happi( Japaneses traditional wear for festival), Uchiwa,Japanese towel etc. will be arranged. Every Refugees with children and friends are welcome !! Traffic fee will be paid for refugee and family. Every supporters can participate ! Some small cake and drink will be prepared. All the REN-stuff are waiting for your participation ! If you wish to participate in this festival, please download the flyer here and check the details. 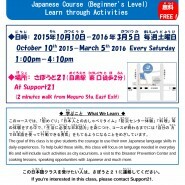 『体験から学ぶ初級日本語講座』の申込受付開始！Registration is now open for “Japanese Course (Beginner’s Level) - Learning through activities”! FRJ Open Day 2016 -Join Us! 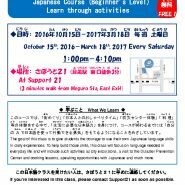 『体験から学ぶ初級日本語講座』の申込受付開始！ Registration is now open for “Japanese Course (Beginner’s Level) - Learning through activities”! 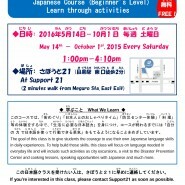 Registration is now open for “Japanese Course (Beginner’s Level) - Learning through Activities”!